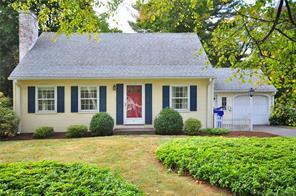 Picture perfect Cape in Newington! You’ll love this picture perfect Cape in a wonderful neighborhood setting! This lovingly maintained 7-room home features a formal living room with fireplace, 3-bedrooms (2 upstairs; 1 on the main level) & 1.1 baths. The spacious white kitchen flows into the dining room where the wall was removed between the kitchen/dining areas to create a nice, open floor plan! The beautiful front-to-back sunroom off the kitchen has a slider to the deep, private fenced back yard, perfect for outdoor fun & entertaining! There are Hardwood floors throughout, a convenient 1st floor laundry, vinyl siding + a 1-car attached garage. The location just can’t be beat…walking distance to the Middle & High schools and just over ½ mile to Newington Center. Great curb appeal + highly desirable quiet, dead end street = the perfect place to call home! The Location of this home is fantastic! Elton Drive is a quiet and desirable dead end street yet is within walking distance to the Middle and High Schools and just over 1/2 mile from the Center! The Back Yard is everything! Wheather by yourself relaxing or with family and friends, this fenced in and level back yard is perfection! There are gates on either side of the house to make access to the front yard a snap and encloses the back deck and patio to keep erveryone safe! The Sunroom with cathedral ceilings, a skylight, ceiling fan, sliders out to the deck and a wall of windows is a light filled, year round oasis! Great for the entire family or…a special place just for you, this Sunroom shines! Contact me to arrange a convenient showing time or obtain more information about this property!